Goods and Services Tax (GST) is a multi-stage consumption tax on goods and services in India. As per the new government norms, GST is applied in a different manner to intra-state and inter-state sales. GST levied on the intra-State sales by the Centre is known as Central GST (CGST) and that by the States is known as State GST (SGST). 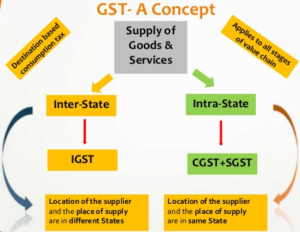 Whereas for inter-state sales, only IGST (Integrated GST) is applied which is directly paid to the Central Government. Indian GST Extension for Magento provides the functionality to apply the appropriate Indian Goods and Services Tax (GST) rates on the products those belong to different tax slabs. It calculates the tax accordingly and displays the tax amounts on the front end view. GST is applied to the product basis and globally. Admin can enable or disable the GST feature. Tax is automatically calculated based on the shipping origin and the customer delivery address. Admin can set the Goods and Services Tax Identification Number (GSTIN) and also can view the GSTIN on the invoice and the credit memo. SGST, CGST, and IGST are automatically calculated based on applied tax classes. Applied GST appears in the order view, the invoice view, the credit memo view, the new order email and the PDFs. GSTIN appears on the invoice and also on the credit memo.